People often ask about psychics and how they can be accurate if the Law of Attraction gives us the power to create our future. After all, we are all energy and connected by energy. When psychics make predictions, they are reading energy patterns – looking at what will most likely happen based upon current energy streams. In other words, psychics analyze present energies. Their predictions are based on the present. The Law of Attraction gives you the ability to take control of your present and mold your future into whatever you desire, thus allowing you to change the energy patterns and change your future. If a psychic makes a prediction and it doesn't come true, it doesn't mean the psychic was wrong. It means that the energies changed…and so did the future as a result. Psychics are only reading probabilities. If you have a psychic reading done for you, a psychic will tell you what will probably manifest if things remain unchanged. Psychic readings can be very beneficial for this reason. They can show you what you are currently manifesting and give you the opportunity to change your future if you so desire. Psychic readings can also help you to get clear on what you want. If a psychic tells you something that you don't like, you can use the reading to help you understand what it is that you really want. The key is to use a psychic reading to empower you. 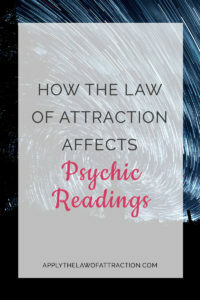 Because a psychic reading can affect how you create your future, it can lead you to create your future for better…or WORSE, depending on how you react to the reading. For example, if a psychic tells you that your wife will move out, you might be tempted to confront her, believing she is about to leave you. This alone could cause enough problems to actually cause her to leave. Whereas the psychic may have simply seen her carrying boxes because the two of you were moving to a new house together or your wife was carrying boxes that contained items to donate. It's important that you get all the details from the psychic and then decide how you should react and, most importantly, what future YOU want to create. Psychics are human and prone to errors, just like you and me. They can allow personal fears and negative thoughts to cloud a reading, just like you and I can allow our fears and negative thoughts to prevent us from creating the future we want. A psychic reading is really just there for guidance. Psychics often say they're simply giving advice – it's up to you to decide what you want to do with it. So, yes, psychics can predict your future, but only your future based on what you're currently creating. You can still use the Law of Attraction to change the outcome. I'd love to hear your thoughts on using psychics…or not using them. If you're a psychic, I'd love to hear from you too! Ultimate Success Blocker - A free 30-second quiz that helps you instantly find out what your #1 block to success is, and most importantly, how to release it so that you can have more wealth, happiness and love in your life. Manifesting Movie - This is better than "The Secret" movie. ❤ It reveals the incredible science behind the Law of Attraction, and teaches you a simple 5-step manifesting technique for instantly unlocking more abundance and success in your life. Mind Movies - My go-to for visualization videos and raising my vibration fast for nearly 10 years. You can get 6 free pre-made Mind Movies here. Thank you for this wonderful information it’s clarified what I thought! And taught me more! I’m now aware what I was attracting and I can work on the ares I need to be more positive about! Thank you! Gemma Benning. What is the Prayer to Manifest Money? How Long Does it Take for the Law of Attraction to Work? AMAZON DISCLOSURE: ApplytheLawofAttraction.com is a participant in the Amazon Services LLC Associates Program, an affiliate advertising program designed to provide a means for sites to earn advertising fees by advertising and linking to Amazon properties including, but not limited to, amazon.com, amazon.co.uk, amazon.fr, amazon.de, and amazon.ca. ©2012-2019 Well Read Gnome, LLC All Rights Reserved. Unauthorized use and/or duplication of this material without express written permission from this site's owner is strictly prohibited.